The other day I had an enlightening e-mail exchange with one of my blogging friends. The main topic of discussion was when it was appropriate to include ads on a new blog. Needless to say, we had conflicting views on the matter. Basically I was at the point where my blog was almost ready to launch, but first I wanted some feedback from other bloggers. Overall the feedback was quite positive, but one blogger was quite adamant that I should remove all ads. His reasoning was that new blogs shouldn’t be allowed to monetize their blog until after about 6 months of posting. Say what?! While I didn’t completely disagree with the concept, I didn’t feel that it was a one size fits all rule that should be applied to all blogs. Since blogs can cover virtually any topic and are written by people of very different backgrounds, should there by any clear-cut ‘rules’ that should be followed by all? Of course if you want search engine traffic, it is best to abide by their terms of service. Beyond that and anything illegal, I think a blogger should have free rein to setup their blog however they want. After all, isn’t blogging about reaching people with your own personal message in your own personal style? Since my blog is focusing on personal finance, shouldn’t I be setting a good example and properly monetizing my blog from the start? Part of me just didn’t feel right purposely avoiding including ads early on when I had every intention of monetizing this blog. I do hope to get some monetary compensation for all the time that I dedicate to producing a quality, helpful blog. What difference does it make if I post those ads from the start or wait a set period of time? In my eyes, it is the classic bait and switch tactic, where you deceptively offer one version of something to start, with a plan of later switching to something that you deem is less desirable. I’d rather present my blog in a more honest fashion with the setup that I intend to follow going forward. It seems sneaky to try to build up a big following as an ad-free blog and then suddenly put up ads when you’ve hooked enough people. It is essentially acknowledging that your personal beliefs are that ads are a negative component. I do not share those beliefs. Perhaps I have a different view than others, as someone with a website marketing background. I may have a better understanding of how the web revolves around advertising. At the same time, maybe that experience clouds my judgement about how the average visitor may perceive ads. So I did read up on what others are saying regarding this decision. There were a bunch of bloggers who have decided to wait for blog monetization, but it didn’t seem like the popular choice. Here’s what one of the blogging leaders, John Chow wrote about placing ads on a new blog. It seems that as internet users get more experienced using the web, they become more accustomed to seeing online advertisements. Some even subconsciously train themselves to block out ads and only focus on the content. When such a high number of sites display ads, it is natural to become more accepting of this practice. I suspect that the advice to avoid ads to start is an old rule of thumb, passed down from a time when more blogs did not have any ads. Back then, you didn’t want to look like a ‘sell out’. These days it is more about being business savvy. I think in many cases it is more about what kind of ads are displayed and in what manner. Take popup ads for example…I think most people would be at least slightly annoyed at that kind of advertising, as it actually degrades the user experience. The same goes for irrelevant ads. If it doesn’t suit your blog’s focus, those ads may come off as a distraction. So the ads I have chosen for Modest Money are only ads which I truly believe can help people save money. At the time of writing this post, both ads in the sidebar on the right are for services or products that are actually free to sign up for. Both of them can be used to improve your finances. I intend to eventually write a blogpost about each of these advertisers and how they can help you. Ironically the bloggers who seem against ads seem to have sketchy loan ads and ads for overseas loan companies. It’s a tad hypocritical to preach against ads and then serve up ads that are not in your visitors’ best interests. While in my case, I decided it was best to go ahead with ads from the start, in certain cases I could see it being good advice. It mostly depends on the blogger’s experience level. You wouldn’t want to discourage a new blogger by telling them to put up ads right away and not see any income for a while. Instead those bloggers would stay more motivated basing goals on subscriber totals, traffic levels and comment activity. Also it may waste too much of their time trying to figure out effective monetization. That time may be better spent learning the ropes of writing posts and basic marketing strategies. For me personally, it didn’t take a lot of time to find some quality advertisers that I had faith in. It took even less time to set up the ads. So for a blogger who is brand new to blogging and internet marketing, I think avoiding ads to start may be a good idea. The niche of your blog plays a role too. If a lot of established bloggers in your niche do not use advertisements for monetization, you may want to be more careful with the decision. The prevalence of ads on related blogs may signal that the target audience is less accepting of ads. Going against the common trend in your industry may reflect poorly upon your blog. That also holds true for the number of ads and their placements. Deciding how to monetize a blog is not something to be taken lightly. It definitely can affect how others perceive your blog. There very well could be people who immediately get turned off by the sight of any ads. Really though, why bother inflating statistics with people like this? That is unless stats are more important to you than actual income. Those same people stand a good chance of unsubscribing once they see a sudden influx of ads. So I recommend being honest with yourself and with your visitors from the very start. It will give you more time to test ads and also possibly bring in some income early on. Just keep in mind situations where it may be best to wait or even consider avoiding ads altogether. Try to avoid letting ads ruin the user experience. What is your opinion about ads on blogs? Do you see it as a bad thing that gives a blog less trust? Honestly, I think that ads are fine (as long as they’re not pop-ups – those are very annoying). I agree that people are accustomed to seeing them, and their eyes pass over them. But if you have a blog and the intent is to grow it – both creatively and monetarily – then what’s the point in waiting? If the point of your blog is to creatively grow it – and you don’t want or need money from something you deem to be free discourse, then sure, skip the ads. They’re not doing any harm, and if anything, they’ll be helping defray the cost of having a creative outlet that (hopefully!) people enjoy. Thanks for sharing your opinion Kris. Yes with so many ads on sites like google & facebook, most people will have accepted ads as part of the internet by now. I think with careful ad choice, the ads can help both the blogger and the visitors. Everyone understand that we all need to make money. An ad or 2 won’t do any harm. Some people fill their site with ads and pop ups. I never visit again. I think your good. You have to make money some how right? Hi Jai. Thanks for the input. A lot comes down to how aggressive the ad implementation is. Still, when there are any ads at all, I guess some people won’t like it. Hopefully those people are a small minority. I think ads are fine, as long as I’m not bombarded with them. Thanks Michelle. I will definitely try to keep them to a respectable level. I don’t want to look at a ton of ads when I’m previewing posts or responding to comments either. I don’t have a problem with ads being on any blog, just like I don’t mind that my The New Yorker magazine subscription comes with ads in it or that my local newspaper runs advertisements, and I actually pay to read those. If I were to follow a newspaper or magazine format, half the page content would be ads. I won’t go that extreme. If anyone ever has problems with the ads on this site, let me know. Well written post! When I first started, I too followed the not to put up ad rules till 6 months in. In my case, it was effective because it forced me to focus on writing, commenting, and building relationships. Do what works best for you. But I agree, I think many internet users are now “used” to ads as part of the experience. Popups are still annoying of course. Nice job! Thanks for the feedback Buck. Yes I am seeing that it will be best to focus on content and networking early on. There is definitely a lot of work involved in getting a blog going. So I’ll try to avoid wasting too much time on the monetization side of things. Hi Jeremy, I recently started a personal finance blog and I’m also playing around with the idea of adding ads right away, vs. giving the content a while to stand on it’s own before adding them. I think either is probably fine. Like many folks have said, people are use to ads so they tend to ignore them anyway. Congrats on the new blog! I recommend basing this decision mostly on your experience level with ads. If it’s going to take a long time to setup and properly optimize, it might be best to wait a bit. Also consider how aggressive you will be with marketing. Do you actually expect to build traffic early on? Or is it more of a long term project? I decided to put Ads on my blog from the start because I would like to learn the process. That way, when my blog gets popular, I can optimize my ads and me revenues. I think it is best to test the waters and learn early about ads so that you can benefit from them later. Yes you have to learn somewhere. It makes sense to figure some of that out before traffic builds up. It can take a while to get ads optimized just right. Just don’t let it be too much of a distraction. I for one come down firmly in the camp that says to monetize right away (although I don’t begrudge anyone who doesn’t). I launched my site complete with ads because I knew from the start that I wanted to monetize my site. Like you mention I thought I may as well start out with ads right away and get people used to seeing them as opposed to adding them later on. Also, while i didn’t make a ton those first few months, I still made enough that it paid for the domain name and hosting for the first few months, so at that point anything I made was profit. I think some people have the notion that their blog isn’t good enough to warrant being paid for their content, or that good blogs don’t need to have ads to monetize. But I think there are different blog monetization strategies, and not every strategy will work for every blog. So I think it pays to think about what your strategy will be, and use banner ads and adsense accordingly. By the way, by the time 6 months rolled around I was cashing out Adsense every month, and was almost making enough through other ad sources to be able to make a big dent in my mortgage payment every month. So I know from first hand experience that it can pay off. Great insight Peter. I agree that you do need to think long term what your monetization strategy will be. It’s not just a matter of building up traffic and the money automatically comes in. If you do plan on using ads eventually, there is little benefit to waiting. With personal finance blogs especially, why would you be talking about saving money when you are missing out on potential money yourself. I like the idea of ads. But I prefer if they are customized to the site and not just randomly thrown up there with no design or purpose in mind. Plus it helps if the blogger uses (or has used) most of the products – like affiliate marketing. It just seems more personal and not so much a selling tactic. I agree that many bloggers can do a better job of picking appropriate ads. If you’re trying to connect with readers and earn there trust, you don’t want to be just putting up random ads that you cannot vouch for. A blog can be monetized without the blogger being a total sellout. Besides, if you are promoting a product that you truly believe in, it is bound to perform better. I am a fan of ads from the start. It keeps things honest, and hey you may get lucky and actually make some money from them. Also my idea has always been the more relevant an ad is the more ethos it adds to the site. A relevant ad in my eyes is viewed as a vote of confidence. Yes you might as well be honest with your visitors if you want them to take you seriously. It looks like everyone here is fine with ads on a new blog. I guess I should’ve included a survey in case people just didn’t want to publicly disagree. Honestly I just ignore ads on blogs. Everyone once in a while I’ll actually see an ad and it might be useful and i’ll click on it. Other than that it is like they don’t even exist! I would have lost out on some money early on if I followed the six month rule because I’m not there yet. I think bloggers in particular eventually just subconsciously block them out. If I’m reading posts I tend to just ignore them, but as a marketer I am interested in seeing what they promote. The 6 month rule is rather unnecessary especially since blogs grow at different paces. I don’t mind seeing ads on new blogs as long as they’re not pop-ups or pop-unders. Those are really annoying…especially if the ad starts playing music or video. Oh I hate those ones that play any audio. I wonder how effective that kind of stuff is if people are willing to compromise the reputation of their site to use those tactics. It does seem to be more shady sites that do that, but I know there are finance blogs that do popups for newsletter subscription forms. Very nice take on this topic. I enjoyed your point of view. Glad you enjoyed. 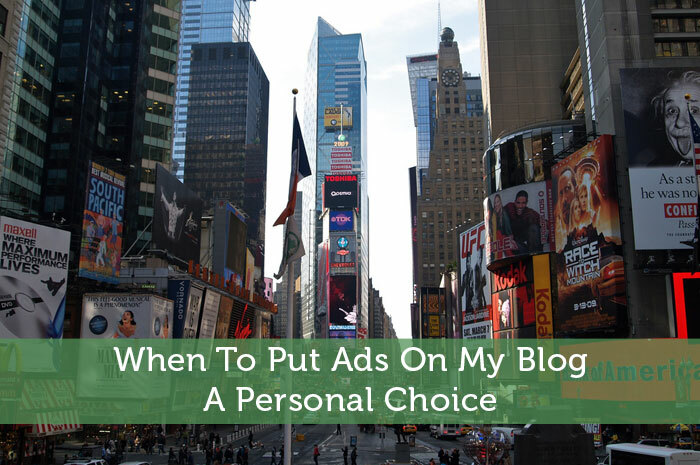 At the end of the day, putting Ads on your blog is a personal choice.